I haven’t gone to MySpace to listen to music for a while. When you can stream tracks from places like Spotify, Youtube or Last FM, why would you listen to a few odd songs from pages that are buggy and take a long time to download? You don’t, and apart from Facebook dominating the social network side of things, it’s one of the reasons MySpace has been haemorrhaging traffic. But MySpace are pushing back into the music streaming market and hoping to get people back on the site for the pleasure of listening to music. 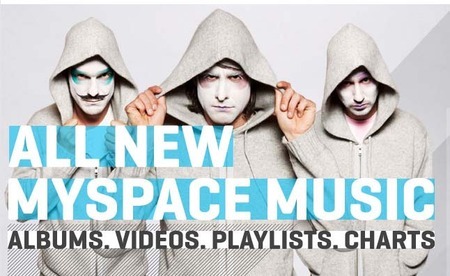 Teaming up with Apple iTunes, MySpace are launching MySpace Music – a music downloading and streaming site. It’s already done well in the US and Australia, and they hope for a similar effect in the UK. MySpace Music will allow DRM-free MP3 downloading and also free streaming. Users will be able to stream MySpace’s entire back catalogues of artists on both major and independent labels. And MySpace claim that they have “the most comprehensive catalogue” on the internet. (DRM stands for Digital Rights Management and provides a digital watermark on music that limits its use). The trump card? No audio adverts, so the music won’t get disrupted, unlike Spotify, the most successful site in the field. There is also the option on MySpace Music allowing artists to share playlists of what they’re listening to and what’s influencing them , so far Lady Gaga, Britney Spears and err.. The Vatican have done so. “Despite the claims in the press release, music purchased through iTunes is in the AAC format and not MP3. This means purchased downloads are not compatible with all music devices” says CEO Ben Drury.